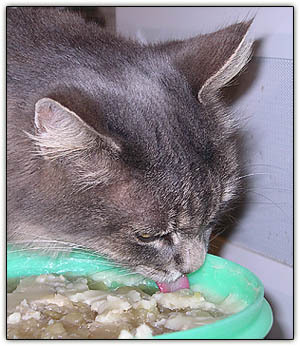 sisu: "If you weren't a blogger, you could become a soup manufacturer"
"If you weren't a blogger, you could become a soup manufacturer"
"It's the best stew I've ever had," says Tuck this evening, echoing Tiny's assessment (above) as she samples the turkey broth (chilled butter bits are the white flotations on top of the gelatinous broth) before we heated it up in a saucepan, added Susie's leftover glazed and creamed onions, buttered peas and bits of the turkey meat that had fallen off the bones when we cooked the carcass at low heat for a few hours Thanksgiving afternoon. We popped a Pillsbury French Bread loaf into the oven for dunking purposes. Wicked great followup to the various reiterations of Thanksgiving 2005. Can you say sandwiches? The official one on the left is wonderful, but the disrespectful one on the right left us with TJLOL. “Black Friday,” the traditional start of the holiday shopping season, began in South Florida early today with a 73-year-old woman being knocked down as a crowd at an electronics store rushed a metal security gate to get inside. Scenes like this were repeated all over the United States. In response, FEMA initiated its disaster assistance plan and President Bush sent troops to all Wal-Mart stores across the country. As the Claude Raines therapist said to healing patient Bette Davis in "Now Voyager" when she wanted to override his clinical protocol and take over management of one of his cases, "Go ahead. Maybe I like it." 'Know what? We think we like this Pyjamas Media phenomenon. Maybe this is the secret heart of where our own Pajamas Media is headed. The herding of cats was a central metaphor of today's blog jam at PM. You can't herd them. But you can pique their interest and get the job done. Historically it was the mice feasting on stores of agricultural grain that brought the cats to the table. If the human drama is the grain, the MSM could be the mice, feeding off the fruits of human labor. Let's bring on the bloggers/cats to keep the mouse population under control. Being compared to ScrappleFace is truly a compliment. Thank you. My cat would have absolutely loved that "stew." Just switch it to fish. By the way, you've got check out this site about the cats in Rome, at http://www.romancats.de/ and for sure read their "history" link.